You’ve decided that you’re ready to experience the rush of paddling down a river, splashing and laughing with friends and family. When preparing for your first whitewater adventure, there are numerous beginner rafting tips that can help you be prepared. By understanding what to expect and how to stay safe, you will be ready to go on the trip of a lifetime! Probably the most important tip is to pay special attention to everything your guide has to say. Our raft guides are highly trained river-lovers who are committed to making your trip as safe and fun as possible. Before you head out, your raft guide will talk to the group about safety tips and what to expect. Be sure to listen closely to this introduction as they will tell you what you need to know before you head out on your river adventure. Once you’re on the raft, continue to listen to your guide. They will tell you when and how to paddle, if you need to lean to one side of the raft to keep everything balanced, and even what to do if a paddler should happen to slip out of the raft. What’s more, your guides are personable and knowledgeable individuals who will share interesting tidbits about the Colorado wilderness and history of the regions that you paddle through. These stories are a great part of a raft trip! At every moment when you’re on the river, your life jacket and helmet need to be secured. Before you step onto the raft, ensure that they both feel snug and comfortable. If you need any assistance making sure that your safety equipment is on and fitting properly, ask our staff to help you. If you happen to forget any of the above, don’t worry! We have most everything that you could need for purchase at our headquarters. Dry clothes and proper attire are the two things that you will want to make sure to bring with you. The end of your paddle has what is known as a T-grip. It is absolutely essential that you always keep one of your hands over the T-grip. One of the most common injuries that can occur whitewater rafting is injuring another rafter by taking your hand off of the end of your paddle. If this happens when you go through a rapid, the T-grip can end up making contact with another rafter. Day trips on the Arkansas River in sunny Colorado carry the danger of sunburns. Do yourself a favor and wear waterproof sunblock to protect yourself from the powerful rays of the sun. It is easy to get burned at elevation! Raft trips are a great combination of nature, scenery, and exercise, and as such, require ample hydration. Warm weather and physical exhaustion can happen, and you want to keep yourself hydrated. Bring a water bottle with you so you can bring it on the raft. There might be times when the river shells out some surprises. Maybe you weren’t prepared for a rapid or your raft gets stuck on a rock. In these situations, the key is to stay calm. When you’re calm, your mind and body will be more capable of listening and doing what you need to do to keep yourself and others safe. While you want to be sure to pay attention to safety and prepare yourself well for your day trip, the most important part is to relax, enjoy, and have a good time! Rafting is a great way to escape the city, exercise, and let go of any stress that your day job might carry. Let yourself be fully present and enjoy the time spent on the river. 1. Can I Go Rafting if I Can’t Swim? You can go river rafting if you don’t know how to swim, but having the ability to swim is always recommended. Let’s clarify. Everyone wears a Personal Floatation Device (or PFD) otherwise known as a life jacket, but it’s only designed to help you float. On more adventurous tours, if you find yourself out of the raft then simply floating won’t necessarily bring you to safety – it’s best to swim to safety. Milder trips see smaller waves and better conditions for those who aren’t the best swimmers. Being able to swim gives a rafter confidence. So, if you slip out of the raft but you have some swimming skills, it’ll make your swim a lot less stressful. 2. How do You Prepare for River Rafting? There isn’t much that you need to do to prepare for your day on the river. Many of our first-time rafters just show up on the day of the trip with a change of clothes. We encourage rafters to read our guest responsibility info to learn more about the sport. And be sure to check out the packing list and bring necessary items with you. 3. Is White Water Rafting Dangerous? White water rafting certainly has some inherent risk associated with it, but then so do all outdoor adventure activities. Of course, the river is under the control of mother nature, not us, so it is important to be respectful of this and take every step to stay as safe as possible. This includes selecting an appropriate trip, listening to your raft guide, wearing your safety equipment, and paddling when and how you’re instructed to. If anything goes awry, every one of our guides has extensive training in rafting and water safety. In fact, our guides at Raft Echo are the best-trained in Colorado. This includes certification in CPR and First Aid, Swift Water Rescue, and Youth Protection Training. 4. How Do I Stay in the Raft When White Water Rafting? 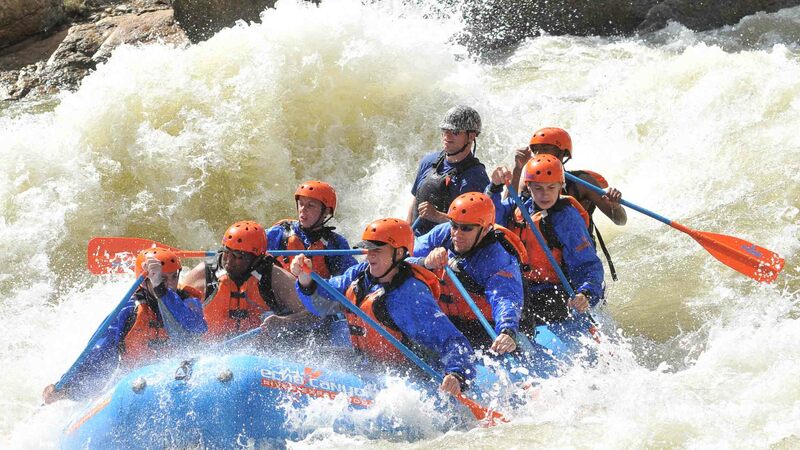 No one wants to fall out of the raft when white water rafting. Fortunately, if you listen to the instructions that your raft guide gives you before and during your trip, the chances of this happening are reduced. You will want to keep your feet secured in the raft where you’re instructed to, and paddle when you’re told to. Listening to your guide is the key to staying in the raft! At Raft Echo, we offer beginner raft trips designed for the timid and the adventurous alike. With full-day and half-day excursion throughout some of the most beautiful areas in the state, we have great options for you. Give us a call if you would like to experience the joy of paddling down river!